Jacob van Artevelde (c. 1290 - July 24, 1345), also known as the Wise Man and the Brewer of Ghent, was a Flemish statesman and political leader. Artevelde was born in Ghent of a wealthy commercial family. He married twice and amassed a fortune in the weaving industry. He rose to prominence during the early stages of the Hundred Years' War. Fearful that hostilities between France and England would hurt the prosperity of Ghent, he entered political life in 1337. He proposed an alliance with Bruges, Ypres, and other Flemish towns in order to show neutrality. Artevelde gained control of the insurrection against the Count of Flandres who was aligned to the French king, and forced him to flee to France. He served as captain general of Ghent from that time until his death. Flemish relations with England had traditionally been good, due to wool and textile trade. Neutrality was eventually broken, and the towns took the side of the English in 1340. In that year, Artevelde persuaded the federation to recognize King Edward III of England as sovereign of France and overlord of Flanders. Flemish trade and industry flourished under Artevelde's semi-dictatorial rule. 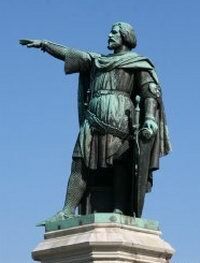 In 1345, however, rumours that he planned to recognise the son of Edward III, the Black Prince, as count of Flanders, suspicion of embezzlement, and the excommunication by the Pope caused a popular uprising in Ghent and Artevelde was killed by an angry mob. His son Philip was later made leader of the Flemish cause.